How to reset video settings on your PS3. Being able to reset video settings, will save almost every PS3 owner from a load of hassle and headache at some point. While the PS3 has tons of video options and settings, this invariably leads to issues when most of us decide to play around with the video settings to find that optimal picture or, we simply move our console to a different TV. The problem comes when all of the sudden we have a blank screen with only sound. The simple solution is to reset video settings and the process to do so is very easy. It just doesn't seam to be common knowledge but, hopefully we can change all that. Make sure that you have only 1 type of video cable connected between your PS3 and your TV or monitor, an HDMI cable is optimal. If you have multiple video connections the reset sometimes does not work. Make sure that your TV or monitor is turned on and set to the proper input for your PS3. With your PS3 in standby mode, turn your console on using the front power button and hold the button down.With the button held down, You will here one beep when the console first turns on, and, after about 4-5 seconds, you will here a second beep. When you here the second beep let go of the button. If you watch the screen you should see it flicker once or twice and then your system should boot up and go to a screen to confirm your video settings. Simply confirm the settings and you should be able to resume playing your PS3 as normal. If your system does not boot up and give you the confirmation screen for your video settings, then you should shut the system off and restart the system as normal. This will usually finalize the reset of the video settings. If your system still is not displaying video then please repeat steps 1-5 again. It is unlikely but, you may have to reset the video 3-4 times before it works with your console. The reason for this is unknown. 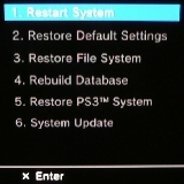 The procedure to reset video ,on your PS3, should be complete at this point and you should be back up and running as normal. NOTES: PS3 "slim" models are always in standby mode when plugged in. PS3 "fat" models must have the rear power switch turned on. If you are only using the composite video cables, then there will be no confirmation screens for your video settings. If resetting video did not solve your problem please see our: Diagnosing Video Issues page under our Troubleshooting section.